A microrobot designed by microengineer Carlos Montemagno walks with the aid of living heart muscle at the University of California, Los Angeles. Living muscle has been considered an attractive alternative to micromotors in microelectromechanical (MEMS) systems. The silicon microrobot is an arch of silicon 50 micrometers wide, just half the width of a human hair. 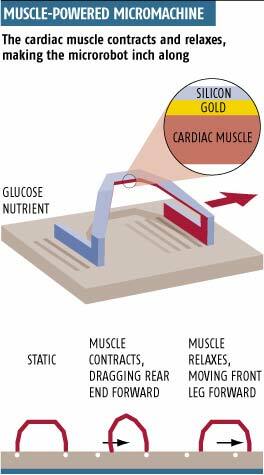 It is powered by living cardiac muscle tissue. The contraction and relaxation of this tissue makes the arch bend and stretch, producing the microrobot's crawling motion. And the fuel? Simple glucose nutrient in a Petri dish - it moves in a pool of fuel. The key breakthrough was the development of an automated way of anchoring muscle tissue to a solid surface like silicon. Fans of science fiction writer Jack Vance will recall the power wagon from his 1967 novel The Last Castle, which was a kind of "macrorobot" powered by muscle power. And the fuel? A syrup consisting mostly of sugar. Read more about this microrobot Robot uses muscle power (Newscientist.com).